Hello, I am trying to find the burial records for those who were buried at a U.S. military base called Fort Liscum, Alaska. It was abandoned at one point in time and the location appears now to house large tanks (maybe oil) on the south side of the Port of Valdez, Alaska. I had a cousin buried in the cemetery there. I learned through the Valdez Public Library there was an article in Fairbanks Daily News-Miner dated 5 Apr 1971 indicates that reinterments were made from Fort Liscum to Sitka National Cemetery in 1929. The librarian at the University of Alaska told me the books were no longer housed there and had been sent to the Sitka Museum in 2011. I contacted the Sitka Museum and they have no record of these books in their collection. My question is -- where can I locate burial records for those who were buried at Fort Liscum? I am trying to learn if my cousin is still buried there or was his remains moved to Sitka National Cemetery? I contacted Sitka National Cemetery and they have no records whatsoever of bodies being moved there from Fort Liscum. Would the National Archives have records for Fort Liscum's cemetery or the Sitka National Cemetery for those moved from Fort Liscum? We searched the Fort Liscum files in the Records of U.S. Army Continental Commands, 1821-1920 (Record Group 393) and the Records of U.S. Army Continental Commands, 1920-1942 (Record Group 394) but were unable to locate records specifically about the fort cemetery. 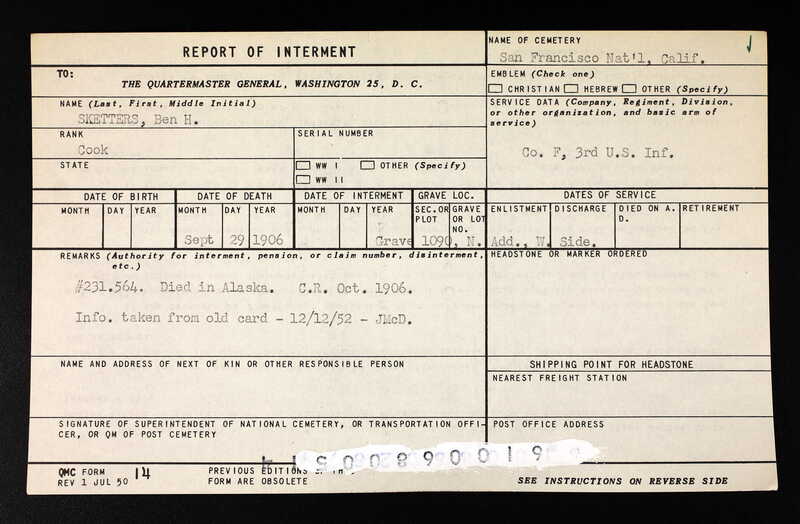 We also searched the Records of the Office of the Quartermaster General (Record Group 92) and located information about the Sitka National Cemetery in series titled General Correspondence Relating to Places, 1936 - 1945. Filed under decimal 333.1, contents of a document indicated that the cemetery included reburials from various abandoned posts in Alaska. Other documents indicated that the cemetery records were supposed to be transferred to the Chilkoot Barracks and the cemetery itself was to be under the jurisdiction of the Alaska Road Commission (part of the Department of Interior). We were unable to substantiate this. Since Sitka National Cemetery is operated by the U.S. Department of Veterans Affairs, we suggest that you check the online grave locator to determine whether your cousin was reburied there. If he was not, you may wish to conduct a more in-depth search for records about the fort cemetery by visiting the National Archives at College Park - Textual Reference. Thank you, Rebecca. This is helpful. The whole matter is a bit frustrating, because I've contacted the Veterans Administration and I've also used the gravesite locator service and they have no record for him at Sitka National. They have no record for anyone at Sitka National transferred from Fort Liscum (at least the person I spoke to on the telephone indicated). This is a contradiction to the article I mentioned above in the Alaska newspaper and the information you were able to locate. When I called the cemetery in Alaska, the staff person I spoke to gave me major attitude and was dismissive to me. I don't live near the National Archives, but it bothers me that the government can just lose a cemetery (Fort Liscum). I am now wondering how many soldiers were actually buried there who have also been misplaced. My fear is my relative (and the relatives of others) are laying under what appear to be on Google Earth those large oil tanks on the south shore of the Port of Valdez. Thanks for looking into it. Do you think that they would have any records pertaining to Fort Liscum within RG 49, Records of the General Land Office. It is possible that there may be something in the Records of the Bureau of Land Management [BLM] (RG 49) but it is more probable in the Records of the Office of the Secretary of the Interior (RG 48) since the land was transferred to the Interior from the Army. Records relating to Alaska could be in the custody of the National Archives at Seattle. Someone else digging around shared this map with me which shows the location of the original cemetery at Fort Liscum. This is the first map I've seen with the cemetery on it. They suggested I should try to overlay this with a Google Earth map, but honestly don't know how to do it. It appears off the center of the fort near a geographic feature called Jackson's Point. If anyone reading this know how to do that, I'd really appreciate any help you can offer. If anyone is interested, I am trying to identify all of the soldiers who were buried at Fort Liscum. I don't believe there were military headstones ordered for them, but I believe they are either still buried in the location of this defunct fort, or they were transferred to Sitka National Cemetery and for some reason Sitka has no records of the transfer and likely has no markers for these soldiers. I'd appreciate any help from genealogists who may be interested in helping crowdsource a list of all the Fort Liscum burials using Alaska death records. Would you be able to release the name of your individual? Have you tried obtaining his service records? Depending on the age you might be able to request his records yourself or if your friend is the NOK you may try having his army service records requested. His name is Benjamin Hardin Skeeters, b. 10 March 1873, Solway, Hardin County, Kentucky; d. 29 September 1906, Fort Liscum, Alaska. He died of acute alcoholism. I'm less interested in the service records as much as I am interested in knowing where his and the remains of the other soldiers who died at Fort Liscum are buried. The media report from the 1950s earlier in the thread mentioned "remains were removed to Sitka National Cemetery." However, after numerous phone calls to Sitka National Cemetery, I have learned they don't have a record of the transfer of Benjamin's remains (nor did anyone I spoke to have any clue about the cemetery at Ft Liscum being transferred to Sitka National). To be quite honest, I found the staff at Sitka National to be unhelpful, uncurious, and disinterested in helping with a basic question about the history of the cemetery they are accountable for. If soldiers from Fort Liscum were removed from that cemetery and moved to Sikta National, there should at a minimum, a record or a marker for these soldiers. I spent an hour and a half on the phone with the Veterans Administration today. I spent over an hour waiting to speak to someone and then when I did speak to a human, I got transferred three times -- each time to someone who could care less about helping put me in touch with whoever in the VA is accountable for national cemetery's in Alaska. This is the department of our government that is supposed to be accountable for those among us who sacrifice everything for our country and even in death they get treated like an invisible. It's un-Americana and un-acceptable. How does the V.A. just lose a cemetery? I know your looking for other burial records, but I found Skeeters Pension File. Wanted to see if you have this already. I don't have the file, but if you want to share it, it may be helpful. A researcher I spoke to indicated the service records would likely only indicate where he was originally buried...but not where the remains would have been removed. Found what you have been looking for, and he is not buried were you think he is. My guess is family had him moved at some point in time. Maybe try asking family members next time you see them. 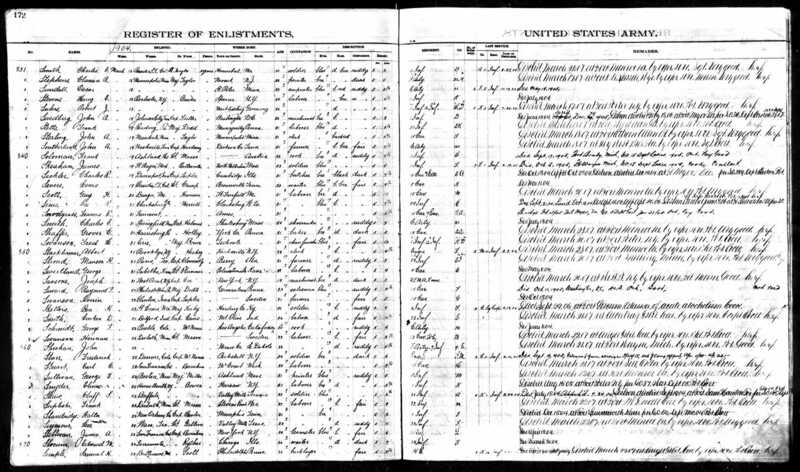 Here is another register of enlistments see him on line item #850 than 6th one down. This will be news to the family. Thank you. Hope this will settle any doubts. Glad to have helped. Were you able to see the attachment I put on here. Yes. Thank you. I have no idea how you were able to find this, but thank you immensely for your help.